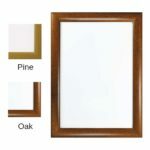 Oak or pine effect painted snap frames – A5 to A0 sizes. 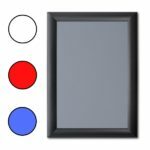 Red, blue, white or black wall mounted snap frames. Premium gold or silver 25mm profile snap frames. Anti slip counter top mat for posters. A4 or A3 sizes. 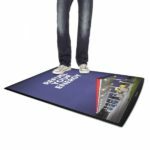 Slip certified floor mat poster pockets for changeable floor advertising. 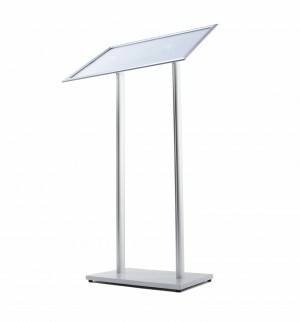 Poster frames are extremely flexible and easy to use. Our range of poster holders include freestanding and wall mounted options, in sizes ranging from A4 to A0. 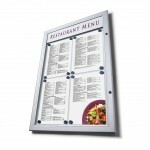 They’re ideal if you’re planning to display fast changing messages as the simple snap mechanism allows you to replace and secure posters in seconds. Choose a poster frame in standard or premium colour finishes for an added personalised finish. Can’t find what you’re looking for? We might have a solution that isn’t on our website! Call us on 0808 274 5400 and we’ll be more than happy to help you. Freestanding snap frames. 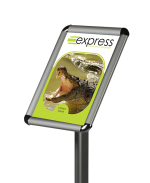 Supported by support pole/s and a base, freestanding snap frames are great for displaying information at a comfortable eye level for visitors. Packing away takes just as little time as it does to assemble. Wall mounted snap frames. 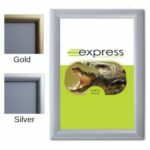 Ranging from A4 to A0 sizes, wall mounted snap frames are super lightweight and easy to mount on walls with a snap frame hook. You’ll often find snap frames in offices, libraries, retail areas… almost anywhere! 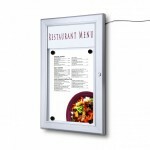 They’re great for displaying fast changing information, because replacing posters is super fast and super easy. Illuminated menu boxes. 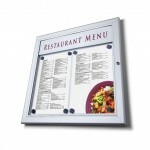 Menu boxes with lights built in are the ultimate poster holder option for restaurants, cafes and food outlets. Not only do your menus stand out during the night, but poorly lit areas suddenly become a point of focus that can draw the attention of passers by. Desk and floor poster mat holders. 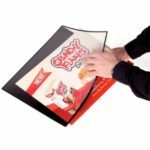 With two-sided poster pocket openings for easy graphic insertion, these poster holders are great alternatives to snap frames. Both desk and floor mat sizes feature anti-slip rubber back profiles to ensure safety. How to use a snap frame? Open all four spring loaded sides until they snap open. Place the poster on the base of the snap frame. Place the poster cover sheet on top. Snap shut the four sides of the frame. Why choose poster frames from us? We stock and ship poster frames right here in the UK with standard orders taking no longer than five working days to arrive. Looking for different sizes? Have a question? Give us call today on 0808 274 5400 and a member of the team will be happy to help.